Beauty Blog by Angela Woodward: How do I get rid of Dark Circles under my Eyes? Dark circles appearing under your eyes can be the cause of several things. Aging, improper skin care, makeup, ect. SO here are some ways to rejuvenate that skin under your eyes and why they work! Women who wait until the skin under their eyes have become puffy a loose have to spend a lot more money to rejuvinate than those who work at keeping skin firm at a young age! If you are older and trying to reverse the effects of aging I suggest Mary Kay Age Fighting Eye Cream ($28). It's hypo allergenic and oil free, and it is used to dramatically lessen the appearance of eye puffiness as well as fine lines and wrinkles around and under the eyes (seen on the left). For younger girls who are trying to prevent signs of aging I'd use the Mary Kay Daily Night Solution ($32 alone or $90 in a 4 piece set). It is a part of their Timewise Miracle Set, and is meant to be used over the whole face. While you can (and are certainly welcome to) use it over the whole face, if you use it under and around your eyes you will have taken care of the most important part of your face! This stuff is packed full of keratin, nutrients and antioxidants essential for the skin renewal process (seen on the right). 3- Throw a Cucumber on your Eyes! Cucumbers are full of wet vitamins that help brighten skin and give it a healthy glow while reducing puffiness, plus it smells great! So throw on your favorite mud mask and put a couple slices of cucumbers over your eyes and soak your feet for 20 minutes on the weekends! Concealer isn't really meant to cover up the darkness under your eyes. 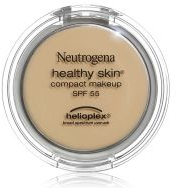 Instead go to Walmart and findcheap Creme-to-Powder foundation (I like Neutrogena Healthy Skin Compact Makeup, seen below) 2 - 3 shades lighter than your natural skin tone. Use a makeup sponge to dab it under and around your eyes and then apply your normal makeup.